I am a big believer in the power that small business owners have when it comes to differentiating themselves through the power of personal marketing. On a recent episode of 3 in 3, I share one really simple way to do this with your own handwriting font and on this episode of 3 in 3, I’m going to share three high-level ideas you can create highly personal marketing, so get ready for 3 in 3! One of the smartest things small business owners can do to differentiate their business is to personalize it by sharing the various stories each business owner has. Here you see how one local Philadelphia furniture retailer is sharing their origin story and how decades later, the same family is still serving their local community. This is powerful and effective. While you are not writing a book, this strategy is just as applicable to the marketing of your business. Get a picture of a current and ideal customer who had a pain/need/desire you were able to help with your product or service. Put the picture in a picture frame. 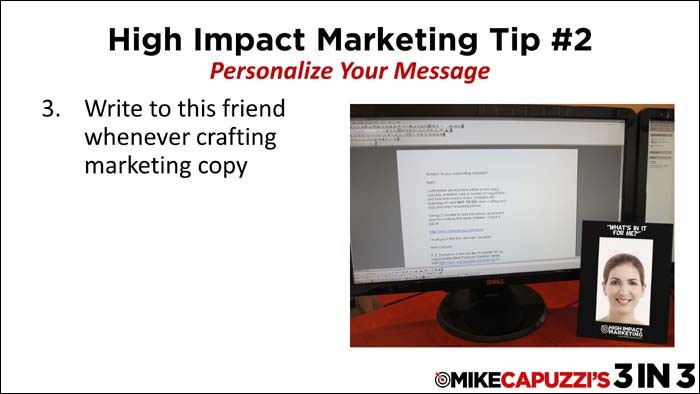 Write to this friend whenever crafting marketing copy. This will help you stay focused and keep your message simple, concise and in a friendly tone. Good marketers don’t write to the masses – they write to one person, just like John Steinbeck instructed. By doing this, your style and tone will instantly change and will result in a more personal message. 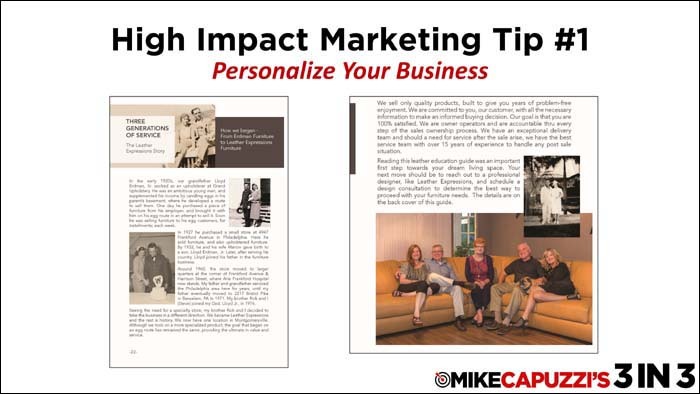 In my opinion, making your marketing look personal is another smart way to differentiate your business. Last year, after we moved, a local Raymour & Flanigan salesman showed some initiative and sent me a handwritten letter and offer, which resulted in an almost $10,000 sale for him. 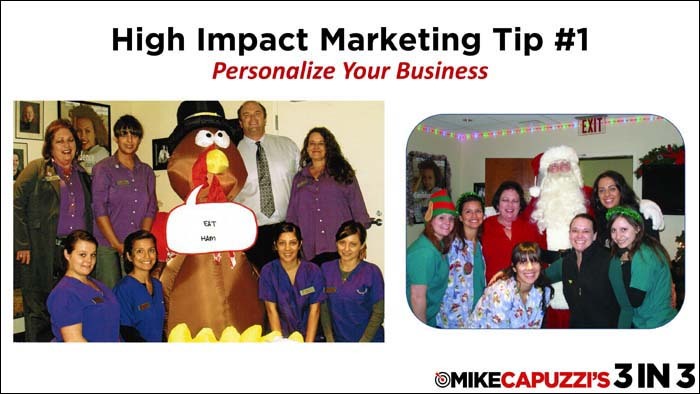 Dr. Brian Bergh does a great job of using fun photos of himself and his team to personalize his practice. In upcoming episodes of 3 in 3, I will share specific strategies on how to make your marketing more personal. So that wraps up this episode of 3 in 3. I hope you found these ideas useful and on future episodes I am going to dive a bit deeper into each of these personal marketing strategies.